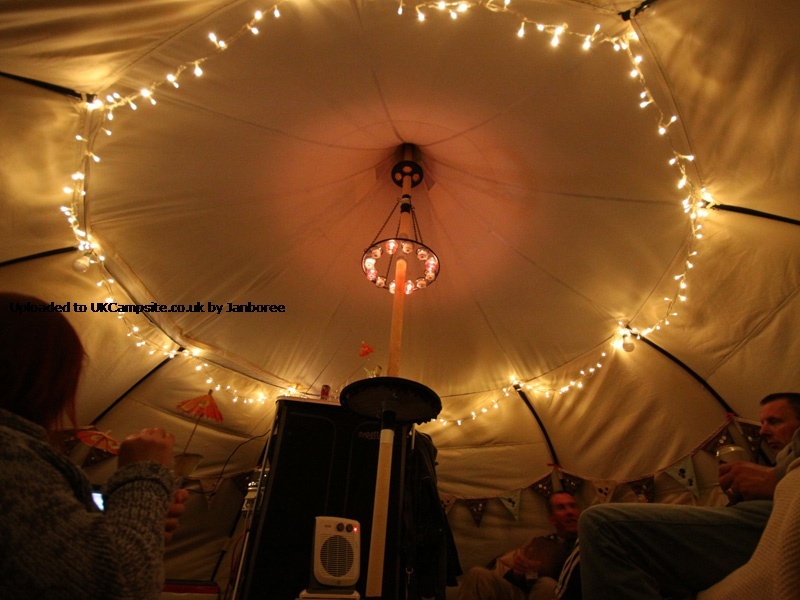 As new campsite owners we want to offer a yurt-like experience for our guests. We bought our first Lotus Belle tent just before Christmas, and with our usual boundless enthusiasm we immediately pitched it in the garden. With two of us it took about an hour to pitch. In future it will be much quicker as we now have the guys tied in place. 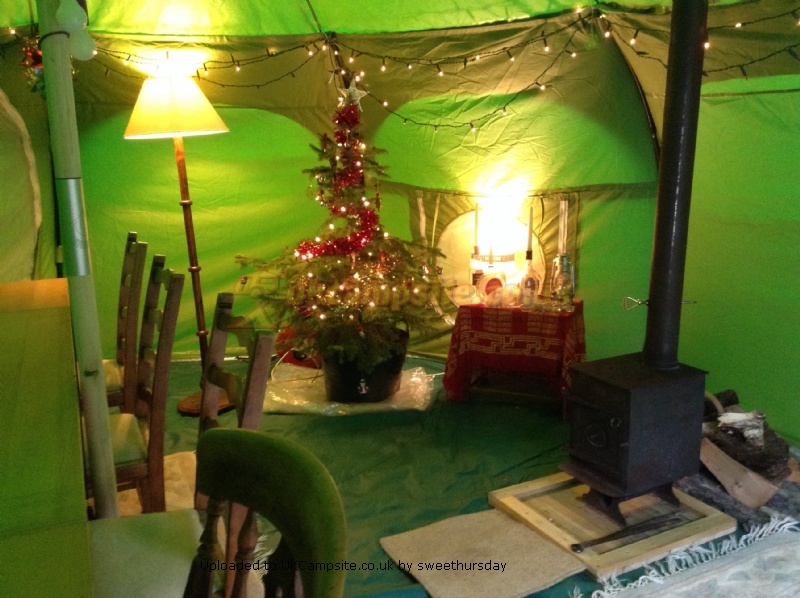 We furnished inside with a table for ten, a christmas tree, fairy lights, and a wood burning stove, and invited our friends round for dinner. They were delighted to come inside where it was super warm and cozy. We also had a night in the tent, this was in January when the temperature was below freezing all night, with the stove and an electric blanket we were toasty warm. 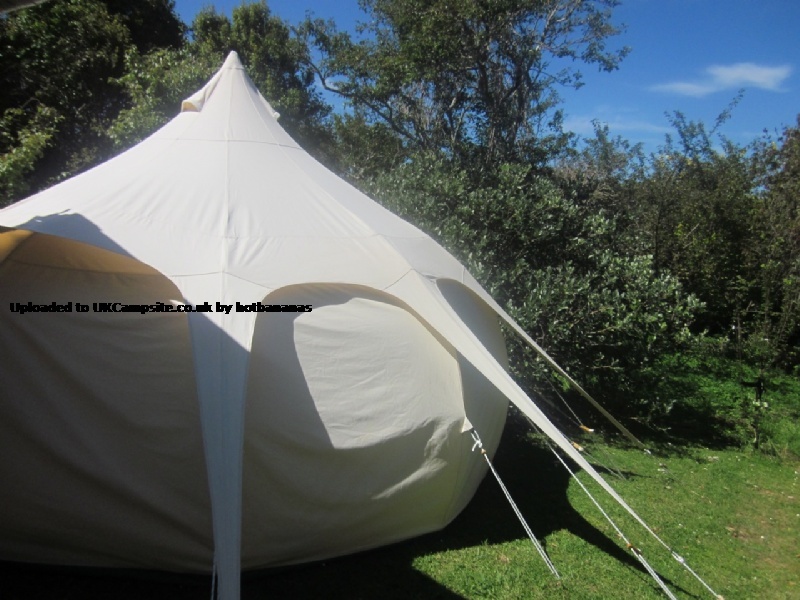 The tent is really good quality, we are confident it will meet our needs this summer for our guests. So confident that our second tent will be arriving soon! Over the last two years, our Lotus Belle has been the first tent I've really felt a great deal of affection for, so much so we call it the 'Disco Tent' due to my sudden, glamping preoccupation with fairy lights. 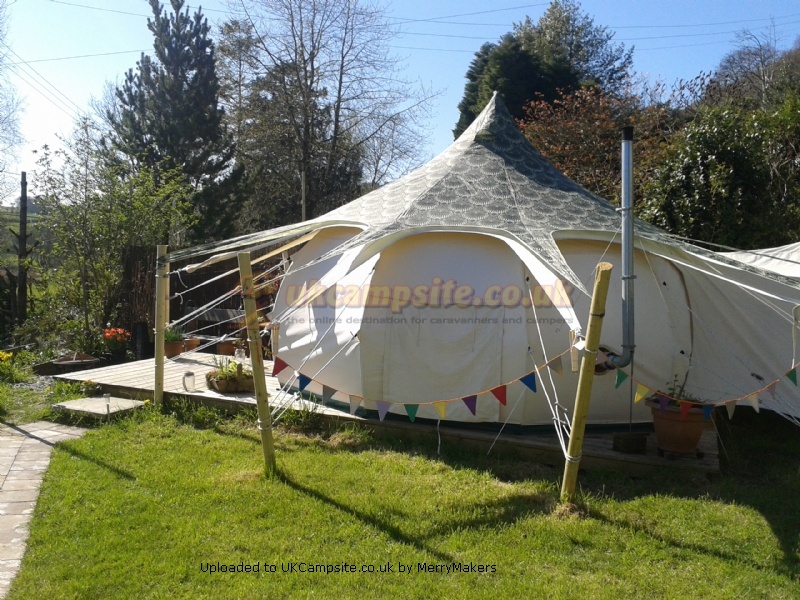 Its construction is very sturdy and heavy duty proving itself twice at the same exposed site, when other tents were being damaged in high winds and torrential rain, by remaining warm, cosy and dry. The deep, paddling pool style ground sheet was also invaluable when we once woke up in the middle of a temporary moat. On hot days the thick, off-white canvas has also been a relief when it has stayed cooler than any of our previous synthetic tents, being able to roll up the porthole windows to cause air flow helps too. I just love waking up on sunny mornings to stare at the shadows on the roof, it is very calming, but the downside is that during early summer the long daylight hours can make it hard to get to sleep and then wakes me too early - an eye mask has been my solution. 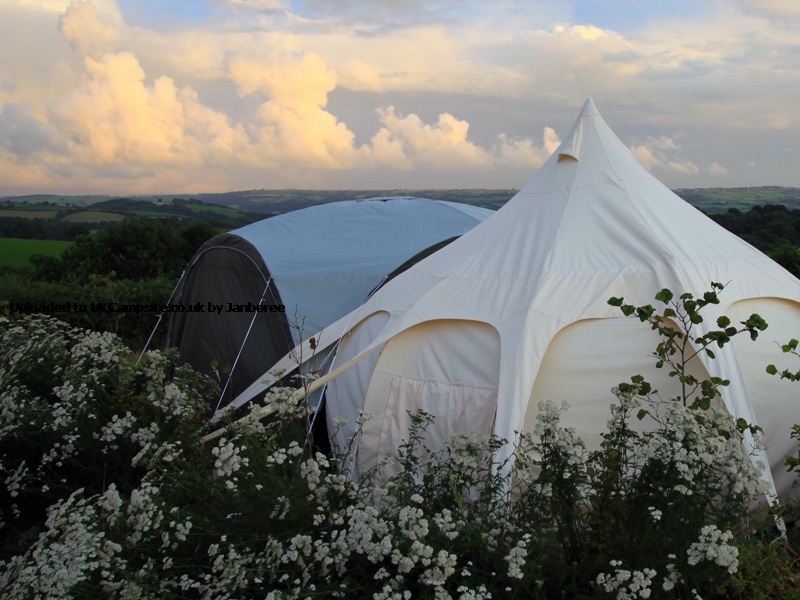 Back when I was first considering a bell-tent in order to make our usual set-up a little more luxurious, the first aspect of the Lotus Belle that appealed to me was head height across the whole diameter of the footprint - unlike the more usual shape. In use this has been great, providing us with an airy, social space into which we can invite our friends on inclement nights. The fairy lights and the tea-light chandelier really make the atmosphere in a space where we can just drink and talk the night away irrespective of the weather outside. We've not experienced any major problems with bug invasions and I do prefer the open interior myself, but I would consider buying the inner tent if we venture up Scotland's West coast again. Weight and packed size are the primary issues: in single bag the tent is a hefty structure to travel with and manhandle. We tackle this by dividing it up into at least three separate bags: the 10 outer steel poles in one, canvas in another, central pole, pegs and groundsheet in the last. This way we can pack the tent around our other camping equipment. Erecting it is straightforward - probably best done by two people, but not impossible for one. The hardest part, for us at least, is getting the curving steel poles into the wall canvas. This year we plan to get around this by installing the poles at home and folding the canvas into a 'banana bag' which we have just bought from the Lotus Belle website. This should halve the time putting it up at site, but does mean we will have to accommodate the 2 metre long banana into the car space - we will have to see how this pans out. Anyway I hope my review is helpful to you if you are considering buying one of these tents. As other reviewers have said, they are extremely well made and robust. They are also beautiful in an unusual way: I really do love the comparisons it gets to onion domes, minarets and yurts - a great way to get to know your fellow campers. Look out for the flashing garlic bulb - it's probably us! What a great tent! We used it for the first time at a little local camp arranged in honour of the 50th birthday of a friend. All are very experienced campers, and know how to throw great parties. The Lotus Belle was an amazing hit and point of interest. Everyone wanted to see inside, and all were very impressed, including several yurt and teepee makers. They loved both the aesthetics and the engineering. One is on the point of buying one. We will optimise the furnishing over the next few outings. 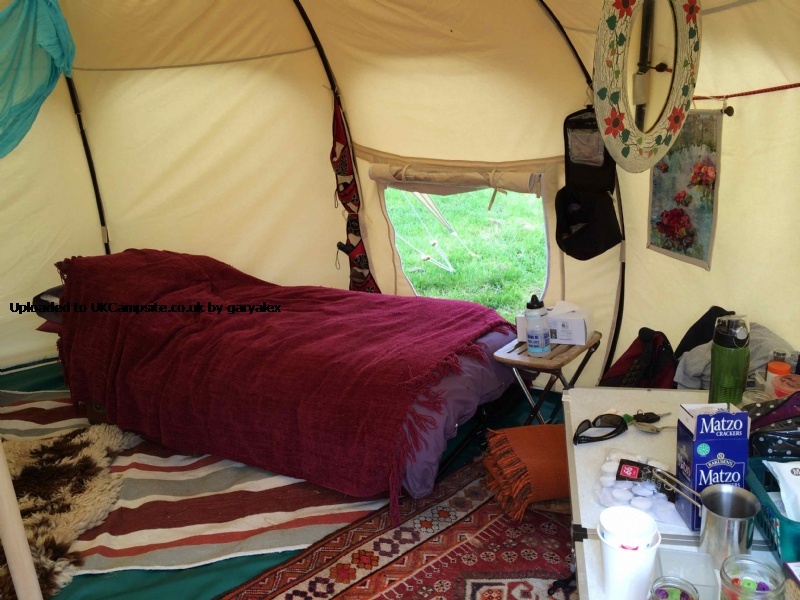 Our photos show our first try (real messy camping, not display for glamping customers). I have just received my lotus belle! First pitching is not yet done (the tent just arrived in my garden in Norway! ), but I wanted to just write a review -as soon as possible- on how amazing the service has been till now. From the first mail until the delivery today, it has been easy/precise/quick to communicate/deal/buy with LOTUS BELLE UK. And will come back with pictures and impression on the tent itself later on. Best wishes. Wow what a tent! Oh my gosh we were so excited when we ordered our tent, it certainly wasnt cheap so we had pretty high expectations. We weren't disappointed! It is beautifully made, the canvas is thick and strong, all the parts are superb quality - like the wooden centre pole even has brushed aluminium joints with logos embossed in to them, and the pegs are just about the strongest I have ever come across in my life. They even put in a mallet for you! Like the other reviews said, it is heavy, but you can split it up in to bags to make it portable and its so worth it when its up. I'd say not a good idea to try and drag across a big festival site on your own with the kids in tow, but you can definitely carry it from the car to a campsite pitch, or put it on a sack truck to pull about, and we can easily fit it in the boot of our car as they claim on the website. The space inside is AMAZING. You can stand up in all of it, even my husband who is 6ft can stand up nearly all the way to the edges so all the space inside is usable. It's such a beautiful space to wake up in in the mornings, the way the roof swoops up in a curve is really calming. All in all, we think its actually really good value for what it is, like DarrylC said - you get what you pay for, and this tent is going to last us a lifetime of joy. Thank you Lotus Belle! We have been camping for many years and have owned many types of tents from lightweight mountain tents through to 8 berth canvas bungalows. Our newest tent before the Lotus Belle was an Outwell Minnesota 4 with the front extension which we purchased about 3 years ago. The Outwell we were very pleased with but impossible to pitch single-handed. An accident in 2011 meant I could no longer lift my left arm above shoulder height, so pitching the Outwell became a painful experience. This spring we started looking at tipis. Seemed a good idea but the sloping sides mean that even with a 5m tent a lot of space is lost. 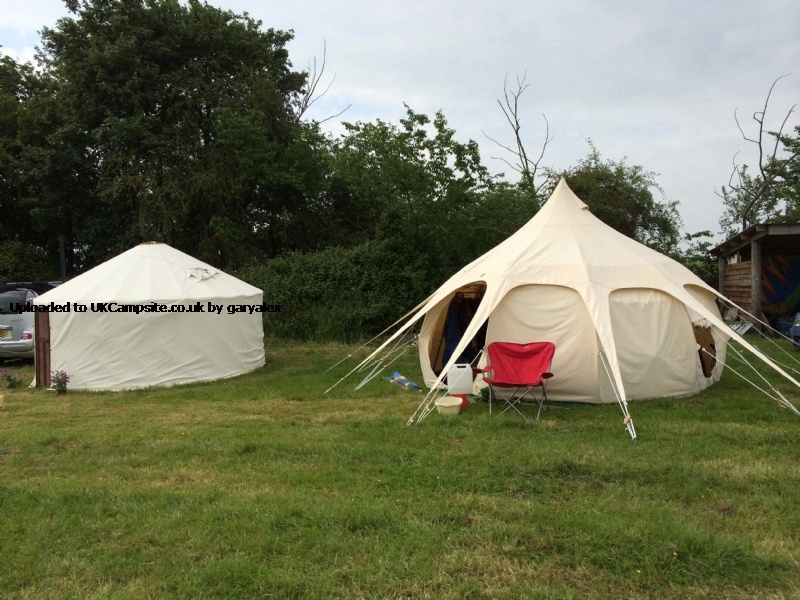 The same with bell tents; better height at the sides, but still lose a lot if like me you are 6ft +. I stumbled across the lotus belles whilst searching the net. The shape was immediately appealing, being an �almost yurt�. The high sides made us think that all the floor space would be usable. We decided on a 5m tent which would mean that the double air-bed could go end-on to the wall and still leave room to walk around the centre pole. The tent was ordered, and arrived by courier in a couple of days. So what do we think of it? Firstly, it is heavy. Really heavy. About 80 kilos for the 5 metre. Just imagine carrying 3 bags of coal across the field and you will get the idea. And being canvas, it�s bulky. It certainly will not fit in an estate car with a family and all the camping gear. But it will split into several bags which makes it easier to move around and store. First attempt at pitching was in a friends paddock on a nice sunny day. Following the instructions, it took about 2 hours, but this included tying on all the guy lines. Once up it is very easy to adjust the guys to get it looking very straight. I was impressed by the quality of construction. All the seams were very well stitched and everything fitted together as it should. It appeared to be a very solid tent. Second pitching was a slightly different experience. The tent was pitched at dusk in driving rain. After trying to put the roof section up first, gave up and pitched it in the normal manner. Went up easily but the groundsheet holds water like a bathtub. Once it was bailed out all the camping gear could be thrown in and sorted in the morning. Despite all the inside of the tent being sodden from the rain, by morning being canvas it had completely dried out. The space inside the tent is huge. We had a double bed, all the cooking gear, two dogs and chairs with plenty of room to spare. Being able to stand up across the whole tent makes a huge difference. Third time I put the tent up easily on my own. The easiest way is put up the walls, throw the roof over and loosely peg with three pegs, Velcro roof to walls then put up the pole. Pros � Very easy to put up, though practice before your first trip. Now takes us about an hour. Huge space. Very good quality tent. You will be the envy of all on the field. Dries out quickly. Being canvas and light colour, much cooler in full sun than a plastic palace. Cons �Heavy and bulky (though can be split to spread the load). 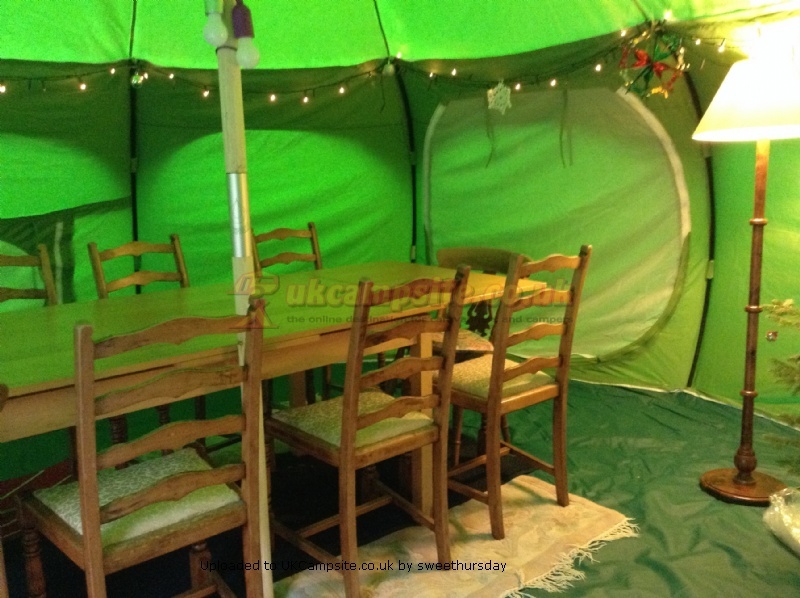 And once you have the tent, you will want the coir mat, chandelier, bunting, fairy lights etc for the full hobbit experience. You will have a stream of visitors on the camping field wanting to admire it. Anything we would do to improve the design? A larger, opening vent in the roof would be good (there are already two small vents). Mesh over the windows would also be good, so they could be open but keep the bugs out. Would we buy another? It�s pricy, but you pay for what you get. So yes, we certainly would. 5 from 5 people found this review helpful, was it helpful to you? 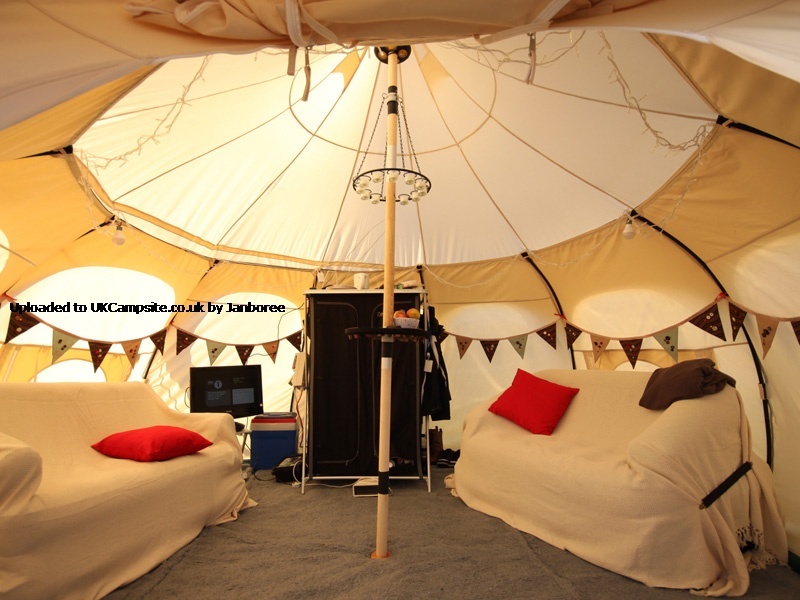 Great tent, loads of space inside, definitely feels bigger on the inside due to the higher walls and the curvy shape. 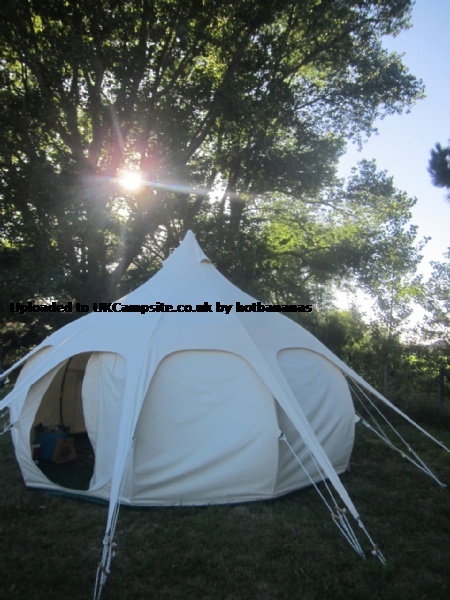 It does take a little longer to put up than a standard bell tent, but I'm much more confident at putting it up on my own than I am with a standard bell as you can pull the walls out in a funny sort of pop-up way that doesn't require you to have more than one person. Manufacturing quality is superb, and all the parts are really strong. We love it, and it looks funky too. 6 from 6 people found this review helpful, was it helpful to you? Add your review of the Lotus Belle! 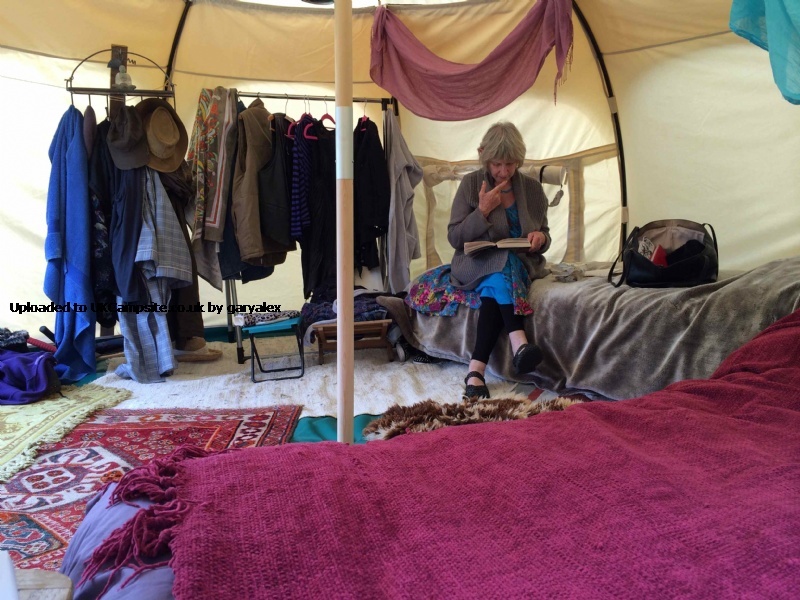 More standing space than a bell tent with a 'tardis' like interior. High quality, heavy duty canvas and PVC base. Sturdy, strong and long lasting. Easy to store, dry and transport and erect. 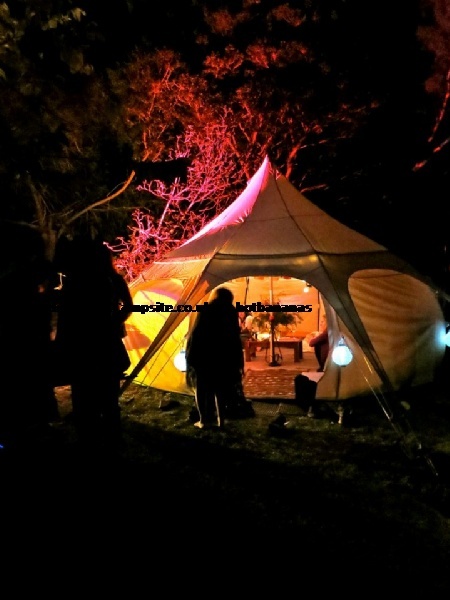 Perfect for glampsites, festivals, weddings, stalls, social spaces. The Lotus Belle has arrived in the UK and is now available to hire or buy. 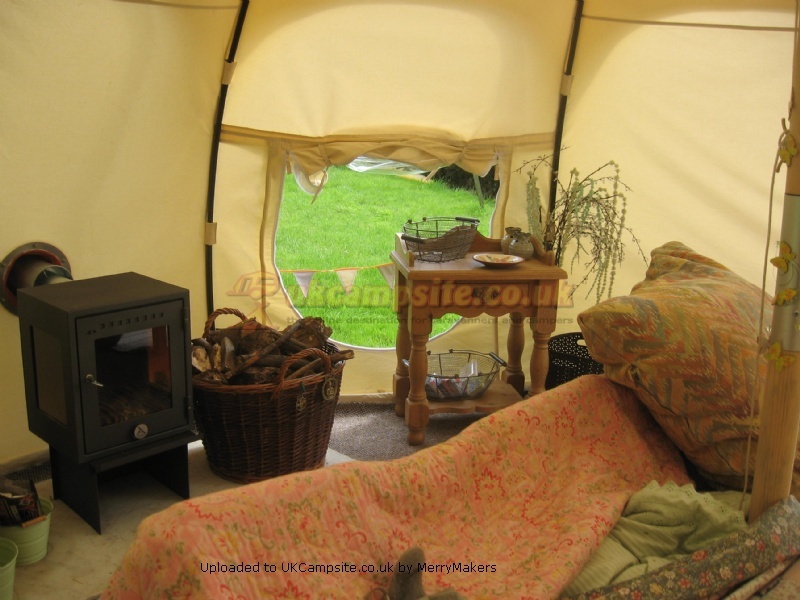 Similar in height to a yurt, The Lotus Belle is unique in providing standing space throughout the whole of the interior, allowing for a much more comfortable camping experience. 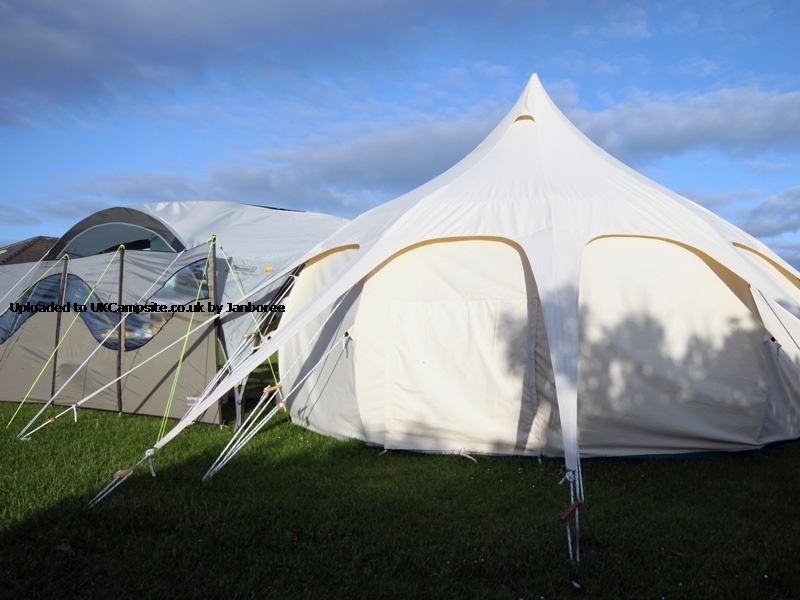 The Lotus Belle is easy to store and transport, with just one centre pole and ten lightweight and flexible wall poles which disassemble easily and quickly.Another original feature of The Lotus Belle is the separate wall and roof canvases allowing far more manageability as well as a much quicker drying tent. The innovative design of The Lotus Belle allows the groundsheet to clip into place on the wall poles creating a �dish� which prevents water and unwanted creepy crawlies from entering the tent. This design also means any section can be unhooked individually. A muddy boot space could be created in this way, or perhaps a space for a fire hearth on a colder night. The Lotus Belle has two windows, allowing natural light to flow in as well as the circulation of fresh air. Each window has a canvas curtain which can be rolled and zipped up.